Dave Dellatore’s research focuses on the ranging patterns and spatial needs of Sumatran orangutans. 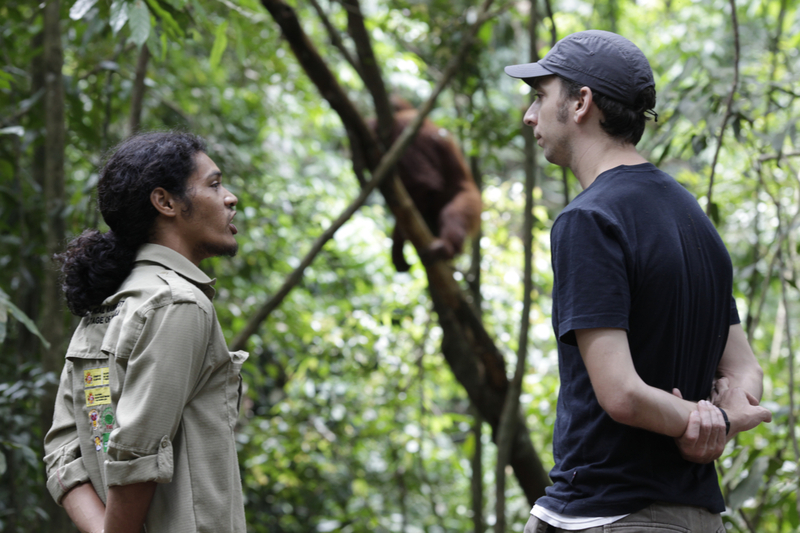 His research is aimed at analyzing a unique long-term (35 years) data set on orangutan behavior collected at the Ketambe research site. He will be using Geographic Information System tools to determine actual long-term spatial use patterns and combine this with behavioral data. He will also address the manner in which orangutans respond to habitat disturbance is largely unstudied and without quantitative figures on spatial needs. The project will ultimately result in the following quantitative outcomes: 1. Long-term home range size of Sumatran orangutans; 2. Long-term habitat use patterns of Sumatran orangutans; 3. Effect of habitat disturbance on ranging; 4. Behavioral response to habitat change. All of which will shed light on such important topics as long-term ranging and long-term behavior of orangutans. This is especially pertinent, as even now with the Sumatran orangutan arguably on the brink of extinction, still today very little is known about its spatial needs and patterns of behavior. Dave is currently also working for the Sumatran Orangutan Society. John Abernethy’s PhD research is focused on investigating the influence of forest structure on Sumatran orangutan densities, distributions, nesting and travel patterns. Understanding how forest structure influences orangutan densities and distributions can help us plan how they will cope through changes from deforestation, selective logging and how they adapt in reforested areas. Orangutan nests are widely used for estimating their population numbers and densities, and also enable research into their habitat preference and ability to cope with change. Given that orangutans spend such significant proportions of their lives at nests we should better understand their nest ecology and site preference. John’s field research in North Sumatra involves a mix of traditional line transects and vegetation surveys along with more modern methods to record forest structure and data about the orangutan nests and their locations. Using this data along with a point cloud derived from prior drone flights over the area the aim is to produce a predictive modelling showing where greater densities of orangutans are likely to occur and from that where conservation efforts and resources are better spent. For her PhD, Noémie Bonnin is investigating chimpanzee distribution and threats in western Tanzania using Unmanned Aerial Vehicles (UAVs). The aim of this investigation is to integrate UAV-acquired datasets to answer questions about chimpanzee presence, landscape change (specifically due to illegal herding, agricultural expansion and deforestation), plant phenological patterns and the spatiotemporal patterns of grass fire. More than 75 percent of Tanzania’s chimpanzees (~ 2000-3000 total) live at low densities on land outside national parks and little is known about their distribution, density, behaviour or ecology. Given the sheer scale of chimpanzee distribution across western Tanzania (>20,000km2), we need new methods that are time and cost efficient while providing precise and accurate data across large spatial scales. UAVs are an innovating tool to achieve this. Noémie is using UAV imagery to answer questions about (1) chimpanzee nests detectability using UAV-derived aerial imagery, (2) key environmental factors that explain chimpanzee distribution in Tanzania, (3) plant phenological patterns impact on chimpanzee dynamic and distribution and (4) the origin and patter of grass fire in western Tanzania and its influence on chimpanzee spatio-temporal distribution. These data help to resolve the distribution and threats of these chimpanzees, which is crucial for conservation planners working to protect existing chimpanzee habitat in western Tanzania. Can you put me in contact with anyone/organisation researching drone noise?